This ultrasound machine allows us to do abdominal and chest (echocardiograms) ultrasounds in house to add an important cutting edge diagsnostic tool to our patients and clients. 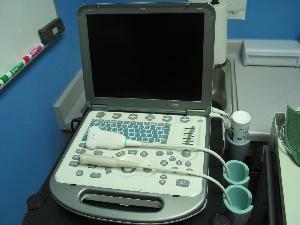 This machine features M and B mode, color flow doppler, a guide to allow for ultrasound guided biopsies, and portability. This machine can be used to evaluate organs, body cavities and masses to help us further diagnose animal's problems and at the same time be less invasive than doing an exploratory and thus easier on the patient.